GROSS! But also totally true. I learned this nastalicious lesson on a particularly difficult night. I don’t remember what I was bawling about, but I do remember being really stuffed up with an awful warm-weather cold and then suddenly… not being stuffed up. Life’s lessons. I just thought I’d drop some knowledge, in case you want to save money. Anyway, I’m sure there’s a direct correlation between my nasal passage-clearing wail sessions (Sorry, totally inappropriate for a blog about cakes and stuff) and my failure to bake/blog. Though I can’t really blog if I haven’t baked anything. I mean, I can, but who cares about what I think of Gotye (Seriously WHO IS THAT?!) or growing basil on your windowsill? 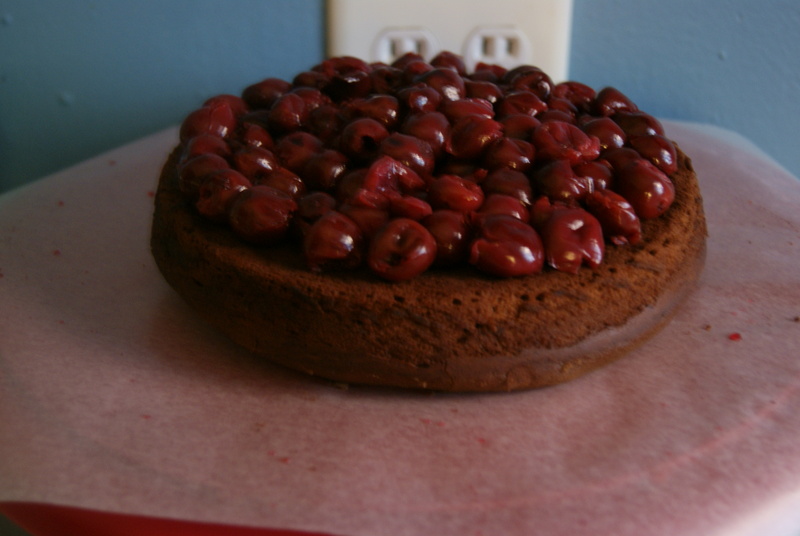 Part 1 of boyfriend’s birthday black forest cake. I’d show you the finished product but…we ate it. 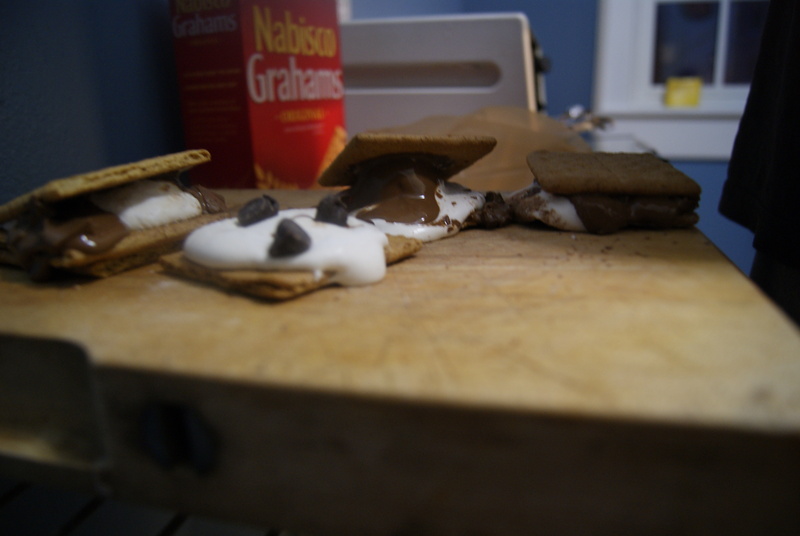 So I decided it was finally time to put my big girl pants on and bake something and then blog about it. Want to know why I chose what I chose? Well, this next dessert struck me as a mash-up of a cake, a muffin and a doughnut. Are you still wondering? Really? No? Ok, let’s do this then. *Since, as you now know, I forgot to pick up essentials before making this, I had to find a substitute for the one egg. 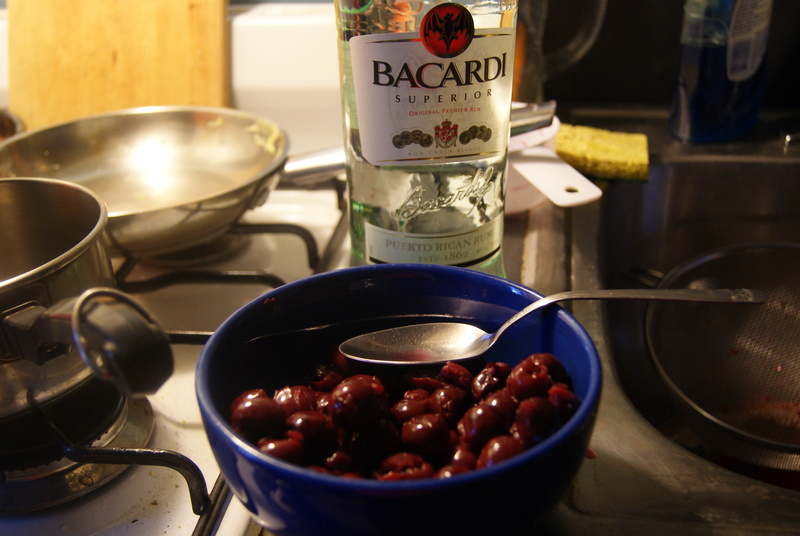 Turns out 2 tablespoons of cornstarch plus 2 tablespoons of room-temperature water works pretty well. In a small saucepan, heat the 1/3 cup of butter over medium-high heat. Stir constantly until the butter has melted and browned and taken on a nutty scent. This is known as browned butter. If you love regular butter, you will fall at browned butter’s feet. As butter does not have feet, you will likely have been immensely confused by that sentence. 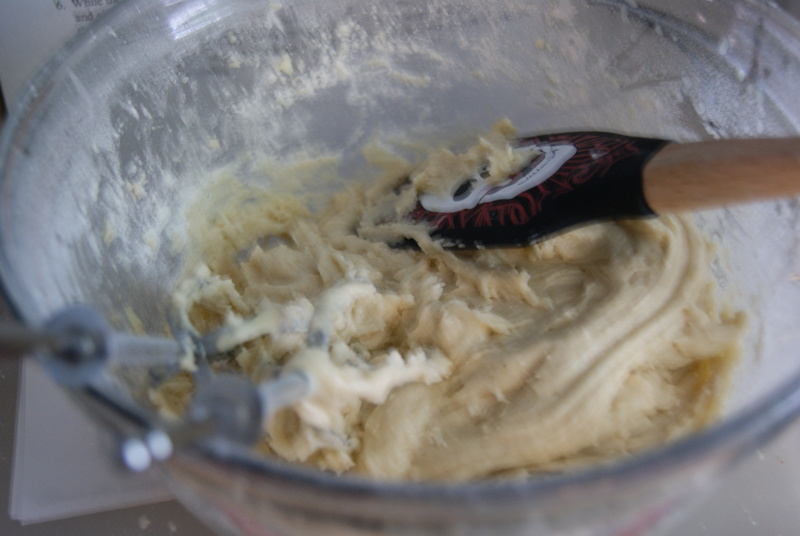 Once the butter’s done browning, pour it into a large mixing bowl and let it come to room temperature. Once the butter’s cooled, pour in the sugar and egg and whisk together, by hand or using a hand mixer, until fully creamed together. Now, in a separate smaller bowl, sift together your flour, salt and spices. Scoop the batter into the cups of your muffin tin, and send into the oven for 20 to 25 minutes, until the tops are golden and the puffs have…puffed. Keep butter in mixing bowl. 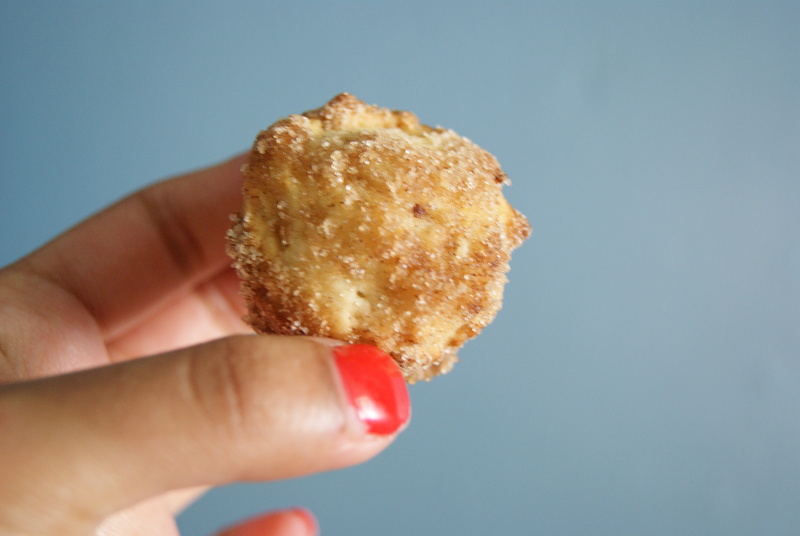 Sift cinnamon and sugar together in a separate bowl, and try to patiently wait for your puffs to be done. You will regret spoiling your appetite by reaching for that Oreo. Once the puffs are done, carefully pop them out of the tin and dip each one in melted butter–making sure to pretty much bathe each puff in it– and then cover each in cinnamon sugar. My boyfriend heard the phrase “cinnamon sugar” and promptly strolled into the kitchen, presumably to help. When I was done dipping the first one, he popped it into his mouth. I didn’t get a reaction, so I assumed he hated them. Then he started dipping and sugaring these and immediately eating them. I was relieved. Then I ate one. Welcome back my wonky thumb! Wow. These are spectacular. Remember how I described what I thought they’d be like? Well, I was wrong. 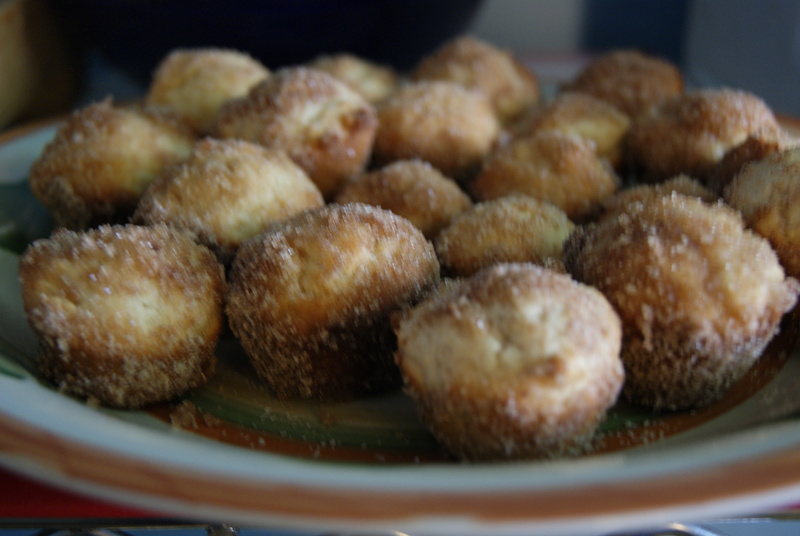 These are more like a mash-up of a cake, a muffin, a doughnut and Cinnamon Toast Crunch. Which is to say, THEY’RE EVEN BETTER THAN I IMAGINED THEY’D BE. Also, there’s an added bonus: we had a lot of cinnamon sugar left over, which we quickly threw into an empty salt shaker for toast/pancakes/directly onto our tongues (don’t hate). It’s the gift that keeps on giving, people. It just keeps on giving. ← Geez…Who WAS That Masked Intruder? Ah Well…Let’s Get Sticky! These look awesome, I was going to make exactly these on Mother’s Day but it would have been too much after the roasted strawberry/Nutella/brie grilled cheese that I made for breakfast. One day I’ll make them and they will be spectacular like yours! The WHAT that you made for breakfast?!? Omg. Now I for sure need to go grocery shopping.